October 7th, 2013 (6:00 PM). October 9th, 2013 (1:10 AM). Lol. That's the whole point. He hasn't made them all yet, he's making them. It will eventually include everything I suppose. January 16th, 2016 (8:06 PM). Edited January 16th, 2016 by MrDollSteak. Although this hasn't been posted in for like 2-3 years I'm willing to take this up as I have some more contributions, albeit not that many. January 18th, 2016 (6:21 AM). Edited January 20th, 2016 by Xencleamas. Woah! 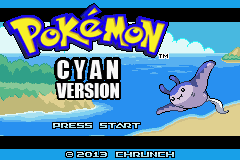 I never knew that there was a DS-style thread for Trainers too (or am I just too lazy? Haha!). Glad that I've found it! It seems to be an old thread, but I would like to contribute sprites here as well. February 4th, 2016 (12:02 PM). I know this isn't exactly what this resource is -- at the moment it's just resized DS sprites -- but I think it fits nonetheless and could be useful for some people. They're FRLGRSE Trainer sprites with updated shading and colouring to fit the DS style. February 5th, 2016 (1:15 AM). 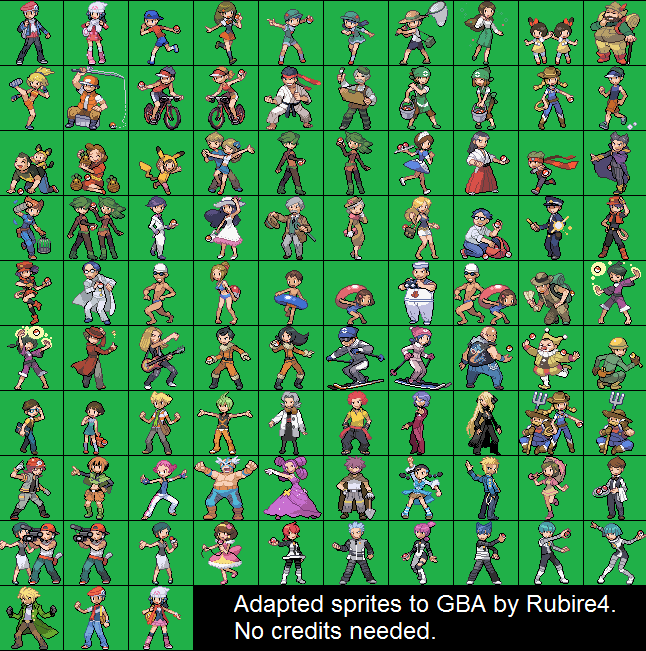 As the new owner of the thread all of these sprites are accepted! Thanks Sky High and Spherical Ice, look forward to more. In the mean time I will also be touching up the current sprites and have re-organised the thread into the categories Gen III Revamps (the type of sprites that Spherical Ice has demonstrated), Gen IV Sprites, and Gen V sprites. Each trainer may also be given the addition tag of RSE, FRLG, DP, Platinum, HGSS, BW or BW2 to refer to which game that particular trainer comes from if it is of a shared Trainer class. Here is the new batch of sprites I have completed. February 5th, 2016 (4:51 AM). Haha you have to add this thread to ur signature..
February 5th, 2016 (8:14 AM). I did resize a good deal of trainer sprites in DarkViolet (though I admit some of them are rushed), feel free to use any of those if you like them. February 5th, 2016 (3:50 PM). good luck with the resource, i find trainer sprites much harder to resize since they're more detailed. you're doing a great job so far! February 6th, 2016 (6:44 AM). Here are more stuff I've been keeping. You may use it for free if you want. February 6th, 2016 (7:57 AM). Is a revamped Jessie and James sprite from Yellow allowed here? February 6th, 2016 (8:38 PM). Definitely accepted! I remember this from ages ago haha! Don't think it fits sorry! Only done one sprite since, the Firebreather! February 6th, 2016 (11:07 PM). Edited February 7th, 2016 by *Luxio//Hacks*. Creator of Sky Twilight + Sky Daylight? I've spend time to resized this male psychic trainer as the female psychic trainer is already done in this resource. Also, I've resized the schoolgirl as a bonus. You could even compare the size for each of them. I hope it's good enough for this resource. Edit: I have done some more sprites. I hope these are good enough for this resource as well. February 11th, 2017 (8:14 PM). June 2nd, 2017 (10:19 AM). Edited June 2nd, 2017 by LuminousWarrior. Well, you don't just take without giving. So, I did the Stat Trainers from Gen IV. EDIT: I'm adding my favorite Gym Leader and personal Rival, Morty. June 19th, 2017 (1:53 PM). Resized Lt. Surge's HGSS sprite for a hack of my own, figured that it'd be helpful here. June 19th, 2017 (9:29 PM). Sprites for Gen V(?) Beauty and HGSS/BW Blue. Nobody seems to know how to properly resize Blue's sprite, so hopefully pushing this one will get rid of the awful ones. July 20th, 2017 (11:48 AM). 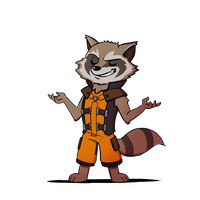 Give credits to KalerioDion for original sprite. All I did was resize and index sprite. No credit needed. Just in case anyone is lazy the palette is here. September 14th, 2017 (5:02 AM). Hey, one thing i noticed here is there are no overworld icons for any of the sprites i.e. like Claire or Falkner. Should'nt there be any resource thread for these icons? December 7th, 2017 (1:48 PM). Edited December 7th, 2017 by cparo. Someone can do the alola sprites 64x64 to? I realy would appreciate it. January 4th, 2018 (2:53 PM). Edited January 4th, 2018 by cparo. I make some sprites using the other ones as base. February 21st, 2018 (1:54 AM). More sprites... while I'm extremely busy in real life. June 8th, 2018 (6:31 AM). Gonna post this here, I think all Gen 4 Trainer Sprites weren't covered. March 9th, 2019 (1:13 PM).